Not everyone has access to the internet. But we are well on the way to pretty much everyone having a mobile phone. And in parallel with that, what those phones can be used for is growing almost as fast. A while ago, I predicted that within three to five years, the sophisticated communication features now found in phones at the top of the market would have percolated through to be being universal. I still expect to see that within one to two upgrade cycles. But perhaps we won't have to wait that long. Two new services from Amazon (so far in the US only, as far as I can see) show how much mileage there may still be in the humble text message. The first is the ability to buy things from Amazon. While it's extraordinary to think of the entire Amazon catalogue reduced to 160 character screens, this has something of the feel of a dancing chihuahua - impressive that it can be done, but very hard to see the use of it. The second service is potentially more interesting - using a mobile to send and receive money, either to another mobile or to an e-mail address, so that you can ‘pay your friends, split a restaurant bill or pay your babysitter’, as the web page helpfully suggests. The idea of using phones to store money which can be used to make small payments is not new - though evidence that doing that has seriously taken off anywhere is harder to come by. But the earlier ideas seemed more focused on using the phone as a smart card with proximity devices rather than having much to do with phones being phones. 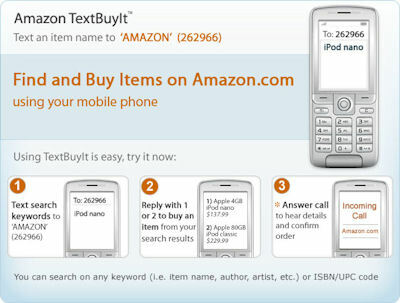 Amazon, by contrast, is making use of the pretty basic fact that phones are communication devices. That ought to have significant potential for public services, just because there is an important part of the population, many of them substantial users of government services, for whom this is their dominant modern communication tool. There are some early examples around (and more on the excitements of car parking in a post still to come), but it would be good to find ways of making better use of the ubiquity of the mobile.